Daniele Brevi ha conseguito la Laurea Specialistica in Ingegneria delle Telecomunicazioni presso il Politecnico di Torino nel 2003, con una tesi sulla sicurezza delle reti WiFi. Nello stesso anno ha iniziato a lavorare presso il laboratorio e-security di ISMB occupandosi tra l’altro, di misure di performance per comunicazioni wireless cifrate su dispositivi palmari. Nel giugno del 2004 è passato al laboratorio di networking facendo partire le tematiche di ricerca sull’utilizzo del WiFi in ambito industriale e lavorando sui primi dispositivi embedded per reti mesh con SO Linux. Nel corso degli anni ha seguito il coordinamento tecnico di diversi progetti sia con committenti industriali sia finanziati dalla regione o dalla comunità europea. Da aprile 2011 è responsabile dell’unità di ricerca Broadband Wireless Access. Le sue principali tematiche di ricerca sono: smart manufacturing (wireless e ICT in ambito industriale), reti mesh in ambienti ostili, comunicazioni VANET e tecniche di visualizzazione dei dati. Daniele Brevi received his Master Degree in Telecommunication Engineering at Politecnico di Torino in 2003, with a thesis on the security of WiFi networks. 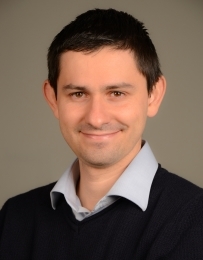 In that year, he joined the e-security Lab of ISMB where, among other topics, he is active in the study of performance measurement of security algorithms on mobile systems. On June 2004 he moved to the networking lab where he started a research activity on industrial wireless communications and embedded wireless mesh systems with Linux. Over the years he was technical leader in several projects both with industrial customers and under regional and European funds. Since April 2011 he is head of the Broadband Wireless Access Lab, his main research areas are: smart manufacturing (wireless and ICT in industry), mesh networks in hostile environments, VANET communications and Visualization techniques. Streiter, R., A. Auerswald, M. Gramaglia, D. Brevi, J. Rech, and C. Liberto, "Performance of the GAIN Enhanced Active Green Driving Assistant", 10th ITS European Congress, Helsinki, Finland, 06/2014. Gavilanes Castillo, G., M. Reineri, D. Brevi, R. Scopigno, M. Gallo, M. Pannozzo, S. Bruni, and D. Zemberlan, "Comparative Characterization of Four Antennas for VANETs by On-Field Measurements", IEEE International Conference on Microwaves, Communications, Antennas and Electronic Systems (COMCAS 2013), Tel Aviv, Israel, 10/2013. Brevi, D., G. Gavilanes Castillo, C. Russo, and R. Scopigno, "Comparison of WiFi-Compliant Techniques for Delay-Sensitive Wireless Monitoring", IEEE ICIT2013 International Conference on Industrial Technology, Cape Town, South Africa, 02/2013. Terzo, O., K. Goga, G. Caragnano, L. Mossucca, D. Brevi, H. A. Cozzetti, and R. Scopigno, "Hybrid Cloud Architecture for VANET Simulations", Internet of things and inter-cooperative computational technologies for collective intelligence, pp. 236-256, 01/2013. Caragnano, G., K. Goga, D. Brevi, H. A. Cozzetti, O. Terzo, and R. Scopigno, "A Hybrid Cloud Infrastructure for the Optimization of VANET Simulations", The 1st International workshop on Hybrid/Cloud computing Infrastructure for E-Science application (HCCIEA 2012), Palermo, Italy , 07/2012. Cozzetti, H. A., G. Caragnano, K. Goga, D. Brevi, O. Terzo, and R. Scopigno, "Design and Quantitative Assessment of a Novel Hybrid Cloud Architecture for VANET Simulations", IEEE 76th Vehicular Technology Conference, Québec City, Canada, 09/2012. Cozzetti, H. A., D. Brevi, R. Scopigno, P. Ferrari, E. Sisinni, and A. Flammini, "MS-Aloha: Preliminary Analysis of Its Suitability for Wireless Automation", 17th IEEE International Conference on Emerging Technologies and Factory Automation, Cracow, Poland, 09/2012. Brevi, D., H. A. Cozzetti, and P. Ferrari, "WiFi in ambito industriale: dalle possibilità odierne al futuro prossimo", SPS / IPC / DRIVES , Parma, Italia, 05/2012.